Brown shoes for women look trendy in style, but matching them with other colors might be stressful. Brown is a man’s favorite color when it comes to shoes, yet it is another cool difficult to match color for women. It is very easy to clash trends when it comes to these brown shoes, brown shoes are expensive and they look luxurious compared to black shoes. But you should always avoid synthetic brown shoes, because they fade-out badly, always opt for pure upper leather brown shoes. So, despite of their color, these shoes also differ in style, some are boots, flats, pumps, high heel sandals, oxfords or loafers. As you can see, this difference in style will also determine what to wear with each style. Tip 1: Complement them with natural colors. A good example is green / yellow. These two colors are classified as Mother Nature colors because most plants have brown, green and yellow flowers. So, if you’re totally confused on what to match with your brown shoes, please go natural. Tip 2: Opt for patterns. Clothes with prints / patterns which match with brown can be a good choice. For example, you can wear a navy blue / white cross stripped dress with your brown wedges. The patterns have to be simple. 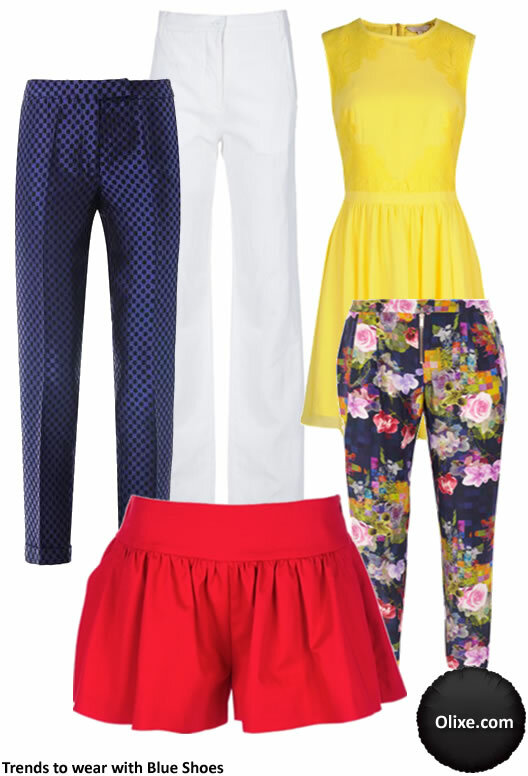 Tip 3: Go for primary colors. A good example of such colors is ”white”. You can wear a white dress / pant with brown shoes. Also black will look good with brown. Don’t color block with brown shoes. However, many people wonder if black can match well with brown. The fact is that when it comes to female fashion trends, these two colors match well. For example, you can wear a short pleated black dress with brown sandals in position (3), if your dress requires you to wear a belt, opt for a slim brown leather belt. Today on Olixe, I have compiled a list of the best brown shoes for women. However, not every top rated brown shoe has been listed here, but i have managed to pull different types of brown shoes so that each of you opts for at least one pair. Our test for brown shoes is more likely to be different from yours, but you will definitely find your choice on this list. NOTE: Links to stores where you can buy these Brown Shoes for Women are listed at the end of this post. A combination of elegance and style has been put into this sandal. Even though you don’t love brown shoes, you will defiantly fall in love with this brown high heel sandal. The elegant front straps means this shoe scores all the marks on this list of the best brown shoes for women. Tip 1: Judging from its formal style, you can wear these brown strap front sandals to work, so the best way to wear them is by teaming them with black stretch boot cut pants, these pants have a wide bottom, so they will drape well on the sandals. Then match your black stretching pants with a slim fit jersey long sleeved top. To add value to your style, you can match the brown sandals with a brown leather shoulder bag. Accessorizing might be a great idea, opt for white beaded bracelet. Tip 2: If you want to wear them with a dress, I suggest you opt for a green or black dress. If this dress requires you to wear a belt over-it, then opt for a brown belt, and then match the shoes with a brown cross body bag / clutch. If you want to accessorize the trend, i suggest you opt for brown stone Chandelier earrings. Tip 3: Try the casual chick style. Wear these brown high heel sandals with hot pink tennis shorts, then complement the pink shorts with a white light blouse which has two front pockets and button-up style, to look stylish, leave the last three buttons open so that your gold chain necklace gets enough attention. Finish this outfit with a brown shoulder bag and gold pleated bracelets. Tip 4: How about wearing them in a classic casual way. I guess most of you would opt for this style. Simply wear flash denim super skinny jeans with these brown high heel sandals, and then match the jeans with a white sleeveless v-neck blouse. To add some class to this trend, you will need to complement the white blouse with a yellow / white check frayed boucle jacket, and then accessorize the outfit with a yellow / brown strand beaded necklace and a brown cut satchel handbag. You can wear a slim brown belt over the yellow jacket. Tip 5: Don’t run out of options, if you don’t have any of the above outfits, pull out those white wide leg trousers and match them with a leopard print sleeveless collar top, then match your outfit with a brown tote bag. Remember to wear a brown leather jeans belt with your white pants. Tip 6: For those who love floral / printed dress, I have not forgotten about you. You can team these brown sandals with a fancy pullover sleeveless floral dress which has both teal blue & brown prints. Accessorize the trend with blue / brown linear drop earrings, gold & blue bracelets and a brown large flap shoulder bag. Believe me or not, every woman needs a pair of flats, these brown flats designed by Yosi Samra have a classic style, you can wear them to work or wear them during the weekend. They feature a bow design on the front and a round toe, so your feet will get no pressure. If you have a very busy day which requires you to move up and down, please fore-go those lovely pumps and go for these flat brown shoes. What to wear with this brown flat? Tip 1: Go Green. You can wear them with army green stretching skinny jeans, and then match the jeans with an aqua blue belted Kaftan top. Now you can complement the outfit with a leopard print classic satchel handbag. If you love accessorizing, I suggest you opt for gold-tone faux pearl earrings. Tip 2: Play it cool by teaming these brown flats with black skinny jeans, match the jeans with a white quilted long sleeved top, and then complement the flats with a brown satchel-tribe bag. For those who love wearing flats with short dresses or maxi dress, you can match this brown flat with a yellow or green dress. 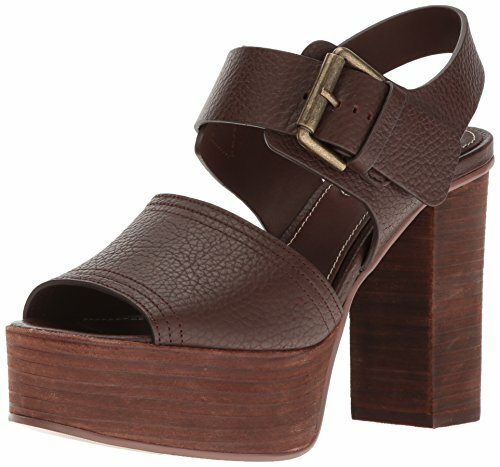 Let’s see what you can wear with these brown platform sandals. Tip 1: Dress like a celebrity. Simply wear a brown leopard print high waist short with a white laidback chiffon top, then complement the top with a slim fit one button yellow blazer, accessorize with a black / gold fan necklace and black Cleopatra stud earrings. Opt for a brown top handle bag. Tip 2: Dress like an urban / town chic: Many times I see young girls copying fashion trends they see on fashion television, up-city girls dress in a very trendy manner, so to look like them, you will need to wear these brown platform pumps with a printed trouser, make sure these pants have black / yellow / red / white prints, because those are the colors which match with brown shoes. Now you can wear crochet yellow shell top, complement the yellow top with an aqua blue knit cardigan and an aqua blue handbag. Accessorize with black beaded bracelet and black round sunglasses. Tip 3: Now let’s try matching these platform pumps with shorts. I know you might be wondering how you will look when you go for this trend, hehehe…I promise, you will look fabulous. Simply wear shiny cooper brown shorts with an ivory ruffled back sleeveless blouse, then match the blouse with a Toga flower knit cardigan, if you love sunglasses, you will go for the cat-eye type. Other accessories like bracelet / necklace can be gold. 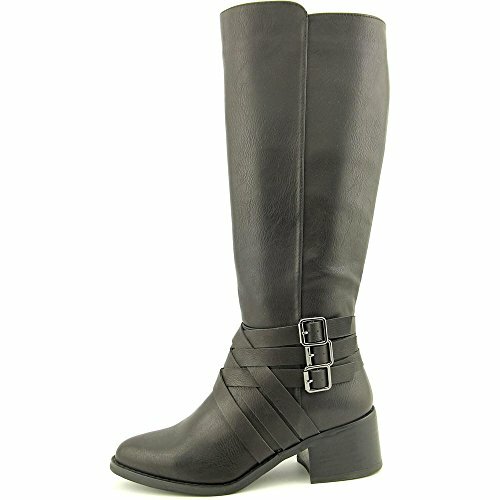 These brown flat knee high boots with a wedge style are too comfortable and easy to wear. Ladies who always want to wear boots during working days or on weekends will love this Brown winter haze boot. You can team these brown flat knee high boots with denim blue skinny jeans, and then match the jeans with a blue sapphire sleeveless top and a brown leather jacket. To add some style on this trend, you can opt for check brown handbag and black over-sized sunglasses. It’s a great boot for weekends. Some times I see ladies wearing such boots with short dress, but please don’t wear them with maxi dresses or maxi skirts; you will hide the beauty of the boots. 5. 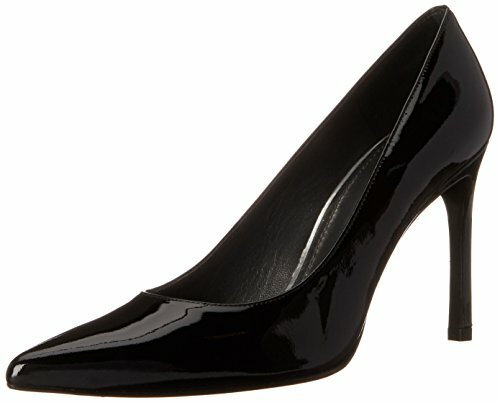 Stuart Weitzman Women’s Heist Dress Pump. 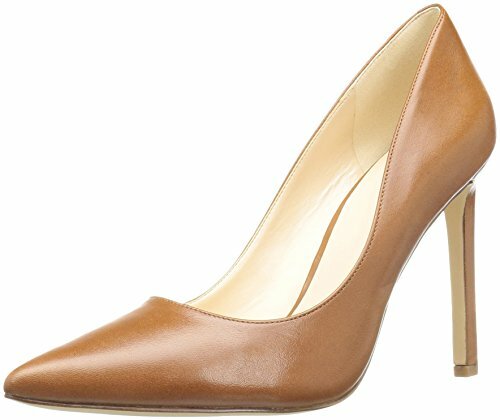 You can wear this thin pointed brown pump to work; it has this classy look which matchs with trousers, suits, pencil skirts and other formal outfits. The pump feature leather sole and a 105 mm heel, so if you’re comfortable with a heel of that height, you might love the shoe. When it comes to colors, you can match it with black or white trousers. These two neutral colors will match with this coffee brown pump. Simply the right brown sandals for this weekend, you can wear them with various casual trends and look smart. They feature a platform style, hand stitched detail, leather upper and an ankle strap buckle. Tip 1: You can wear these brown high heel sandals with flared denim blue jeans, then complement the jeans with a white v-neck top and a brown leather jean belt. Tip 2: For those who love white / ivory lace dresses, this brown platform sandal will match with an ivory lace dress, accessorize with a brown exotic tote bag and gold pearl earrings will be a great idea. Tip 3: How about teaming them with khaki straight pants and a brown ethnic top. Complement your trend with a tan brogue messenger bag and an ivory beaded necklace. All busy ladies will tell you that they prefer short pumps to pointed high heel pumps. These woven detail brown pointed toe pump will give you the opportunity of doing more with less energy at work. You can wear this brown short pump in various ways. Tip 1: Wear them with a brown tweed pencil skirt, and then match the skirt with a white metal embellished chiffon blouse. Accessorize with a gold straw clutch and golden rain leaf earrings. This is a great fashion trend for working class ladies. Tip 2: You can also match them with Hampton khaki pants; these pants have a straight fit so you will look elegant in this trend. Simply match the outfit with a belted orange kaftan top, and then complement the trend with a brown animal skin handbag. You can accessorize with handcrafted wood brown sunglasses. If you fail to get an orange brown belted top, you can opt for a black sleeveless top. Tip 3: Try to match them with a green front wrap short dress. Match the green dress with a blue open front blazer and a brown criss cross clutch. You can accessorize the trend with blue beaded necklace. This is a cool trend for women who love color blocking. You don’t have to worry about this trend, without doubt , brown matches with green. 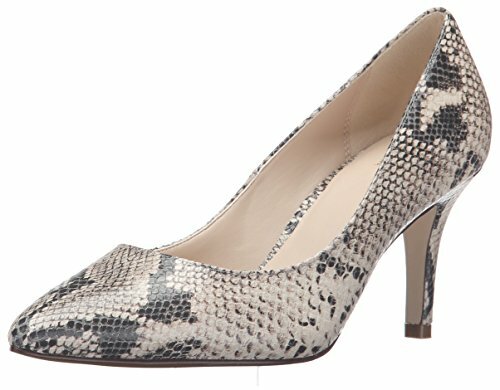 This snake print short pump looks fabulous, though they come at a high price compared to your normal leather short pumps. You can wear this brown snake printed pump with black wide leg trousers, complement the black trousers with a tan brown leather belt and a white long sleeved formal top. Wedge sandals look better in brown color than black or any other color. This Bed Stu Women’s Petra Wedge Sandal features an open toe front, a buckle strap to ensure that the sandals fit you well and a platform wooden sole. 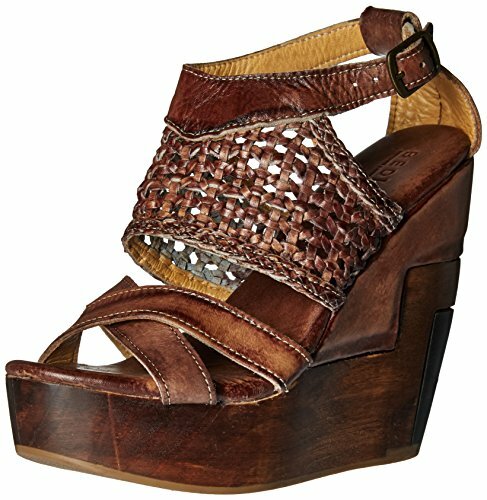 You can match this brown wedge sandal with various casual outfits. TIP 1: You can wear them with damaged denim blue boyfriend jeans. The best way of looking fashionable in this trend is by folding the bottom of the jeans above the ankle so that these wedges get enough space and attention they deserve. You can then complement your damaged jeans with a white / black horizontal stripe jersey top, brown looped belt and a denim beach vest. If you want to accessories this trend, I suggest you opt for a brown leather bracelet and a brown tote bag. 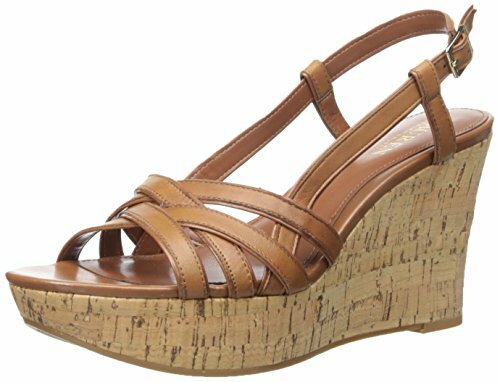 Tip 2: Try to wear these brown platform wedge sandals with a navy-blue barbet belted dress, this type of dress looks more like a high low dress on the front , it also has pleats and it’s short but raised on the front. Wear a brown slim belt over the navy dress, this will complement the wedges. To accessories, you can opt for ivory earrings and ivory beaded necklace. Tip 3: How about mixing them with a classic outfit. In this case, you can wear white linen wide leg trousers, and then match your white linen with an aqua color blue sleeveless blouse. A brown handbag will complement the wedges, then accessorize with aqua blue dust wire earrings. Judging from their formal / casual style, you can team these brown leather Chloe Sandals with a folk quilt dress, if you can get this dress, you can opt for a white / yellow or green above the knees belted short dress. These brown sandals feature a cage strap style which makes them unique. You can complement them with a yellow tote bag. We all know that women have this wired obsession about shoes and one of their favorite colors is blue. It is very rare to bump into a lady’s closet and fail to find a blue shoe. I personally like women who wear blue; it does not matter if it’s a blouse, skinny jeans, pants, dress or skirt. However, this blue color differs in style, for example we have electric blue, sky-blue, dark blue, navy blue, and aqua blue. So this difference in color prints will also determine what to wear with that particular blue shoe. The other important thing to note is that, women have various types of blue shoes and these include pointed pumps, platform pumps, medium heel pumps, high heel sandals, keds, flats or ballet flats and so much more. All these types of blue shoes have their own way of styling, so always know what to match with each type of blue shoe. Since blue is a secondary color, you will not have so many options of matching it with most colors, so lets get down to the basics of choosing and matching blue shoes with other fashion trends. Go Neutral: Since blue is a secondary color, complementing it with neutral colors like white / black will be a good idea. However, don’t wear navy blue shoes with black outfits. In this case, you can wear an electric blue or aqua blue shoes. Be Romantic: Blue is a romantic color, so if you plan to go for a date, i suggest you opt for an electric blue shoe and a yellow / white dress. Try the Chic Style: If you’re below 40 years, you still have a chance to dress like an 18 – 20 yr old. So you can wear blue platform pumps with studded black shorts and black tights then complement the trend with a black corset top. Go Color Blocking: Confident women will always opt for this style. Match bright colors like Yellow with your blue shoes. Be free and go for jeans. You can match blue loafers or keds with skinny jeans , folding the bottom of your jeans will add some value on your looks. 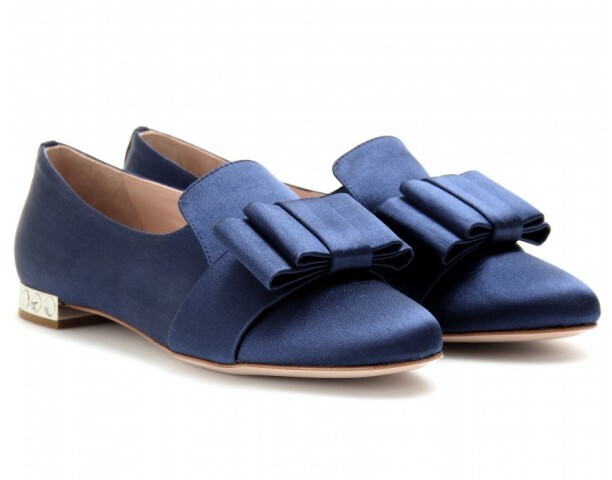 Today on Olixe, I have compiled a list of the best blue shoes every woman would love to wear. I know my test for shoes is a bit different from yours, but I’m sure you will find a shoe which fits your test. I have also included tips on what to wear with each blue shoe. NOTE: Links to stores where you can buy these Blue Shoes for Women are listed at the end of this post. Fashion is all about looking good and feeling comfortable when you wear some thing trendy. I always see women who make a mistake of wearing expensive uncomfortable shoes, this makes no sense but I guess that is the price of looking good! But their is something cool with these open toe high heel blue sandals, (1) they look fabulous, (2) your toes will get no pressure, so you cam wear them for a long period without feeling any pressure, (3) you can wear them with more than one fashion trend. Please, don’t get me wrong, I also love pumps and pointed toe heels, but when it comes to rating, i would suggest open toe high heels, the comfort and style of a shoe matters a-lot. 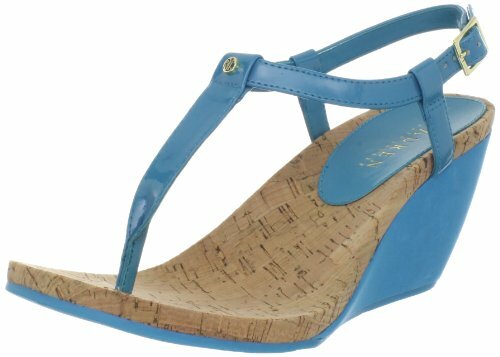 These Ralph Lauren Women’s Rosalia Soft Patent blue leather sandals feature a 3 inch heel and blends natural cork with a glossy upper which gives the shoes a contemporary look, open toe style for relaxation, blue front strap, ankle strap to ensure that the sandals fit you well, and a 3 inch heel which makes them cool. Tip 1: If you want to wear these shoes to work, party or date, you can team them with a printed sleeved bandage dress. Make sure that this dress has black/ blue / white prints, then complement your cool trend with a black leather clutch and black accessories. Tip 2: You can decide to go blue by wearing a plain Caribbean blue trista dress. This type of dress has long sleeves and it looks good on women with slim waist and moderate hips. You can complement this trend with a snake print purse / clutch bag, and then accessorize with blue feather earrings. Tip 3: How about paring them with white skinny jeans. Blue looks good when matched with white outfits, so you will look fashionable if you wear these blue sandals with white skinny jeans. Match the jeans with a black / blue / white top, and then complement the trend with a gold yellow handbag. These beautiful shoes are highly rated on Amazon, they are very affordable and come in a wide variety of colors. After a long stressful week, you need to get rid of those high heels and pumps and opt for these blue boat shoes. Without doubt, you will love these because the comfort and style which comes with them will make you feel comfortable and relaxed. During hot days, you need to wear light and cool shoes, the type of shoes which will keep your feet cool. Women who have blisters and foot problems which are caused by wearing tight pumps, I suggest you go for these. They feature canvas upper, and Non-marking outsole with Wave-siping for the ultimate wet/dry traction. 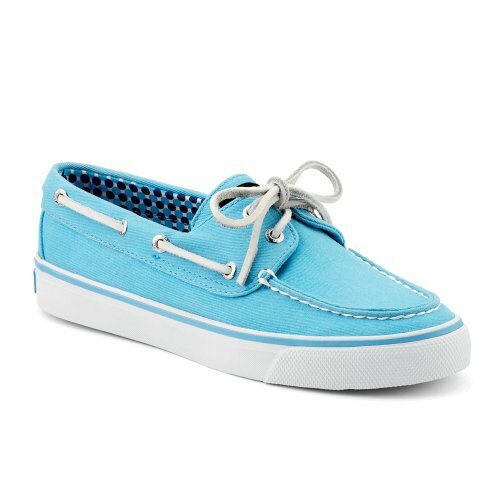 How to wear these blue Sperry Top-Sider shoes? Tip 1: Team them with a floral short dress. I guess you have always seen women who wear short floral dresses with sneakers, now this is type of sneaker they opt for. To look nice, you will need to go for a blue / pink / white floral sleeveless dress. Tip 2: You can wear these blue keds / sneakers with a white denim dress or white shorts. Just keep the style simple by accessorizing with a leather bracelet and a blue cross shoulder bag. Tip 3: If you love red, then these blue keds will match with red high waist shorts. In this case, you can wear a blue/white polka dot sleeveless top, button-up the top and tuck it well so that you look smart. For accessories, you can opt for black round sunglasses. Tip 4: Trendy chicks, you can also wear them with a floral short skirt. To look fashionable, opt for a short skirt which has blue / red / black prints, and then wear a red plain top to match with the red prints in the skirt and a blue sweater over the red top to match with the blue keds. Complement the trend with black tights and a red chain leather shoulder bag. The sky is the limit when it comes to these blue Pointed Toe Platform High Heel Stiletto Party Pump. You gotta love the style of this shoe. The reviews on Amazon recommend to buy a half size lower, so if you normally wear a 9 you should by 8.5 size. This pump can match with both formal and casual trends. It features a pointed toe and comes in a wide range of trendy bold colors. You can wear them to work, date or party. So, let’s see what you can wear with these navy blue pumps. Tip 1: Try them out with blue print floral pants. To look stylish, you can wear a floral pant with blue / white / black prints, and then match the pants with an electric blue top and a blue / gold gradient leather clutch. Then complement the trend with a black sequined jacket. 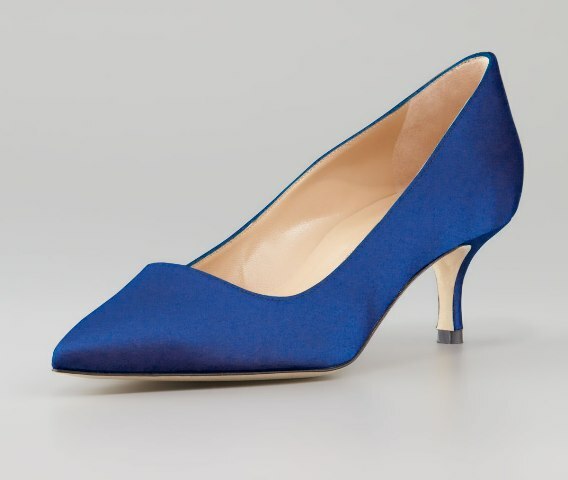 Tip 2: If you love white, then you can match this navy blue pointed pump with a white dress. If your dress requires you to wear a belt, then opt for a navy suede blue slim belt. To add value to this trend, you can accessorize with blue earrings. Tip 3: Go bright by wearing these blue pumps with a yellow dress or pants. Both yellow and blue complement each other, so you will look beautiful in this trend. Match the shoe with a blue handbag and blue accessories. You can also wear them with a yellow pleated skirt, match the skirt with a pink collar top and a blue blazer, then finalize with a pink leather handbag. Tip 4: How about going blue through out. You have to be very creative when it comes to fashion. So, you can wear a check blue / black brocade trouser and a strapless navy blue satin top, accessorize with a blue watch and a navy suede clutch. Women who love to dress and impress, this is the type of shoe you will need to wear and get all the attention you need. You can wear it with pants, dress, and skinny jeans. Since it has mixed colors, you will have more than one option of matching it with other trends. 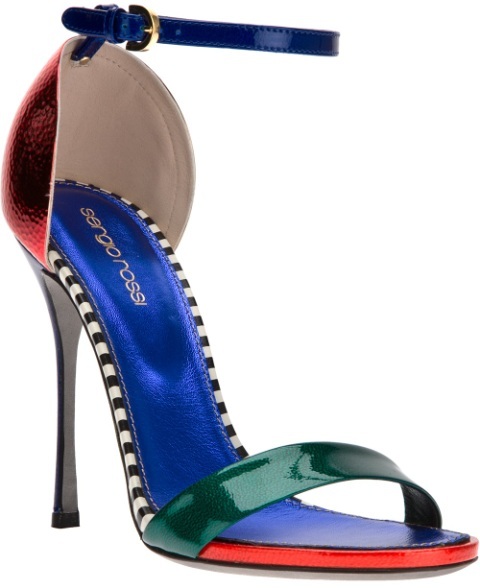 This SERGIO ROSSI‘Flashy’ sandals feature a glittering green front strap, multi-colored upper leather, a blue ankle strap which has a gold-tone side buckle. It is a very lovely sandal for parties. I would not recommend you to wear it to work because it’s too flamboyant. Tip 1: Play it cool by teaming them with white wide leg trousers. The wide bottom of these trousers will drape well on these sandals, so you can match the trend with an electric blue top and a stripped blue / white shoulder bag. To accessorize, I suggest you opt for white drop earrings and a white gold bungle. Tip 2: Try the GOSSIP GIRLS STYLE. Many young girls love to dress like gossip girls, so you can pull this multi-colored sandal with electric blue skinny Samantha pants, then match the pants with a white sleeveless top and a gold sequined jacket. When it comes to accessories, you can opt for a gold / blue bangle. I know of some ladies who prefer wedges to high heels or platform pumps. This is because, wedges have a flat sole, so you can wear them for longer hours without experiencing any trouble. This peep toe pointed wedge can match well with a yellow pleated short dress, white or red shorts and a white short casual dress. I also see some girls wearing them with UNION JACK printed denim shorts. 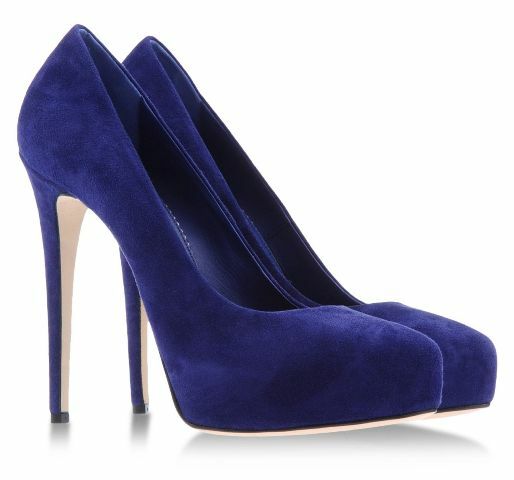 Platform pumps lovers, what do you think about this blue suede pump. It has a very unique perforated design which will make you unique and fashionable. The leather insole and suede leather sole makes them durable. You don’t have to worry about fitting issues; simply use the ankle strap buckle. 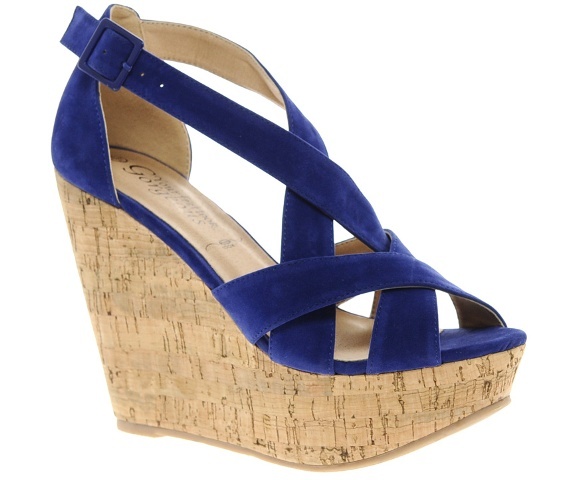 When it comes to styling these blue pumps, you can wear them with black pants or a simple floral sleeveless dress. Complement them with a cream belt / clutch. It is not a must that every woman should wear pumps or high heels to look fashionable, actually some women look smart in flats and loafers. If you’re tall, you might find high heels or platform pumps very uncomfortable, so opting for these blue loafers will be a great idea. They feature a pleated bow front which makes them unique. If you want to wear these blue loafers to work, you can team them with gray skinny jeans, and then match your jeans with a white floral top and a pink blazer. Hidden platform pumps look good on casual outfits. You can wear this blue closed toe pump with a yellow twisted sleeveless dress. Then complement your trend with a blue clutch and blue accessories. Yellow is a bright color, so it will match with this dark blue navy pump. Short pumps are easy to wear. Many busy women who don’t want to miss-out on the pump fashion trend opt for these short pumps. They have the same shape like high heel pumps, but they have a short heel of about 50mm, quite stable on the ground, so you will move without having any trouble. It also features a pointed toe and leather insole. You can wear this blue short pump with black dress. Make sure the dress goes above the knees; don’t wear short pumps with maxi or long dresses. Aqua blue is a very lovely color, but very few women wear these aqua blue pointed pumps because the color is not easy to match with other trends. You will need special trends for this aqua blue pointed pump. The shoe features aqua blue nubuck leather, pointed closed toe and a high stiletto heel. Tip 1: Team these pumps with pink high waist shorts. This is a formal / casual way of wearing shorts. Women who wear shorts with pumps look fashionable. In this case, you can complement the pink shorts with flora print silk chiffon blouse which has pink / light brown / black prints. Then conclude the trend with a pink leather handbag. Tip 2: Match them with black. Since aqua blue is bright, it will look nice when matched with black outfits. In this case, you can wear black leather shorts with a white deep neck top and a white single button blazer. Then accessorize with black round sunglasses, black shoulder bad and a black fedora hat with an aqua blue ribbon. Tip 3: Try color blocking. If you’re comfortable with bright colors, you can wear an aqua blue top with a pleated flared yellow skirt, and then match this trend with this aqua blue pointed pump. Pink lipstick and a pink slim belt will add value to this trend. It is true women love wearing red shoes, however, these red shoes differ in style, which means that also the way to style them differs. 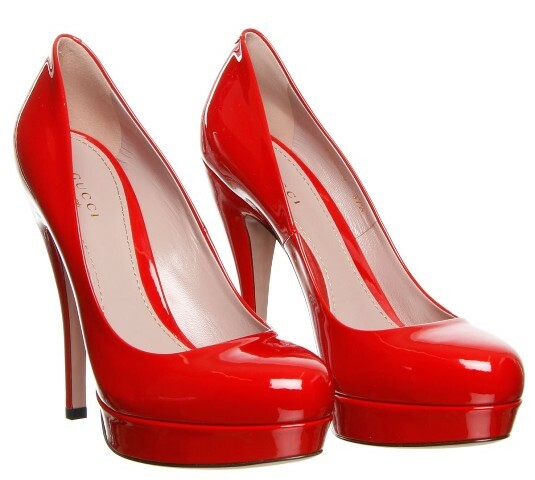 For example, women have red pumps which they wear with pencil skirts, dresses, pants and suits. But you have to be careful when matching red shoes with other fashion trends, because red is a bright secondary color which matches with a few colors, so, I advise you to try out your red shoes with complementing outfits and colors, if your not sure of your looks, try asking someone close at home. If you’re looking for a red shoe to wear to a date, opt for slinky red stiletto pumps, these shoes will match well with your red or black dress. Don’t go for a date in red flats shoes or ballet flats. Keep your outfit simple and cool. Women who love wearing red shoes to work, i advice you to keep your trends simple, the shoe is already bright in color, so don’t match it with bright colors like yellow or white. Simply complement them with black or dark grey outfits; this will calm down the bright red pumps or flats. Opt for short red pumps for work. I beat of you can wear those high heel red pumps the all day at work. I know you want to look fashionable, but why impress others when you’re not comfortable, yes, red heels look fabulous, but opt for short heels. Try out different shades or red: It is true, red has different shades, and some red shoes are too bright while others are a bit dark. If you feel uncomfortable with bright red shoes, then opt for dark red shoes. Fashion is about feeling comfortable and confident. Today on Olixe, I have compiled a list of the best red shoes every woman would love to wear and I have also included tips on what to wear with each red shoe. I know my test for women shoes might not be that great, but I’m sure that each of you will find at least one great red shoe on this list. NOTE: Links to stores where you can buy these Red Shoes for Women are listed at the end of this post. When we talk about real elegant red shoes, this Gucci Lisbeth Patent Red Platform pumps rocks number one on our top ten list of red shoes for women. For a minute, let’s forget about how much it costs, and concentrate on the style and beauty of this pump. Unlike other cheap pumps with wired platforms and funny toe shapes, this one was crafted in such a way that you can wear it with almost every classy outfit. The heel measures 135mm and a 25mm platform which features a black piping around the sole. The round toe will ensure that your toes get no pressure, so you can wear these red pumps for a long time during the day without feel any discomfort. Tip 1: My first option will be a black and white dress. These classic red pumps will match with a black and white, make sure the dress is not too long or too short, let it stop just below the knees buy just 1- 2 inches. Then complement the trend with a black purse and black earrings. To add value to your looks, you can wear some red lipstick, and also polish your nails red to match with the red pumps. Tip 2: You can team these red platform pumps by Gucci with skinny denim jeans. In this case, I will go for denim blue jeans with a simple fade. Now you can match your skinny jeans with a metallic top and a metallic handbag. You can as well wear some red lipstick and red nail polish. If you don’t want the round toe red pumps in position (1), I’m sure you will love these red sharp pointed suede pumps designed by Gianvito Rossi. They also feature a slip-on style which makes it easy to wear these pumps; they have cushioned leather sole which makes them look elegant and durable. The options of styling these sharp pointed pumps are limitless, because they have both a formal & casual look. You can wear them to a party, to a night club, to work and a date. Since they go to all these places, this means that also the trends to match with them are limitless. 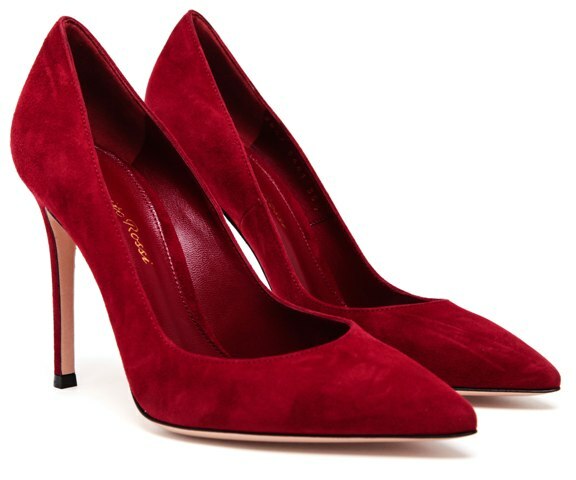 So, what can you wear with this sharp pointed red suede pump? Tip 1: If you want to wear them to work, keep your fashion trend very simple but elegant. For example, you can wear these red suede pointed pumps with a black pencil skirt, make sure the skirt stops just below the knees, then complement your black pencil skirt with a white top with a red, black, white, floral collar. This floral collar on your white top will create some contrast with the pumps and the black skirt. If you fail to get a top with a floral collar, you can wear a red square scarf with your top; tie the scarf so that it looks more like a draping collar. Then for the bag, you can opt for a chain link red & black leopard print shoulder bag. Tip 2: Women with class and integrity, you can wear these suede pointed pumps with flared pants. White, red and black pants will look good with these pumps. For those who prefer red pants, I suggest you opt for bright red pants; a good example is the type of red on shoe in position (1). Since the pumps have dark red suede, they will match well with a bright red pant; you can then match the pants with a white sleeveless top and black slim blazer. Complement the shoes with a dark red suede purse. You might love to wear a red shoe, but you have this feeling that you want something unique and outstanding. 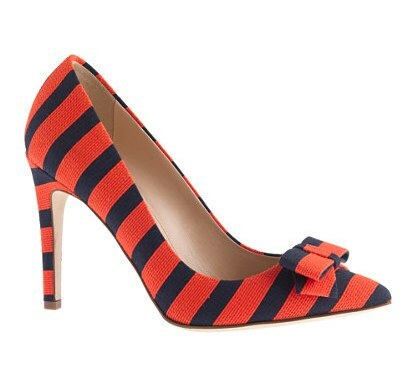 In this case, forget about the plain red shoes; go for this stripped red and navy blue bow pump. This pump features a pointed-toe, a stripped style and a bow on the front. It also has a slip-on style, the heel is not to raised, so if you always have issued with high heels, just try out this medium heeled pump and feel the difference. Tip 1: You can team these stripped pumps with a navy blue pencil skirt or navy dress. If you wear a navy blue dress, you can complement the pumps with a red slim belt over your dress and a red purse. Tip 2: White pants will match with these stripped pumps. Simply wear a navy top with your white pants to complement the navy stripes on the pumps. You might not want to wear closed pumps or sharp toe red pumps, but you also want to look fashionable by wearing red shoes to a party, date or work. In this case, I suggest you opt for this red platform high heel red sandal. This is a classy platform sandal designed by a famous designer ”Saint Laurent’’, he might be gone, but his legacy will still remain, you can tell the quality of this red hue just by looking at the shoe. It features buttery leather upper, wide straps, t-strap style, open toe, and a raised platform. When it comes to durability, you don’t have to worry about that, because these red hue sandals have a leather sole and 1 1/2 platform, strong enough than most pumps. Now, what can you wear with this Red Hue Platform Sandal? Tip 1: Many times I see celebrities wearing platform sandals with short dress, i guess you can also wear a short red dress with this red platform sandal, if the dress requires you to wear a belt, you should opt for a black belt and complement it with a black purse and accessorize with black earrings, then wear red lipstick to create a color balance. 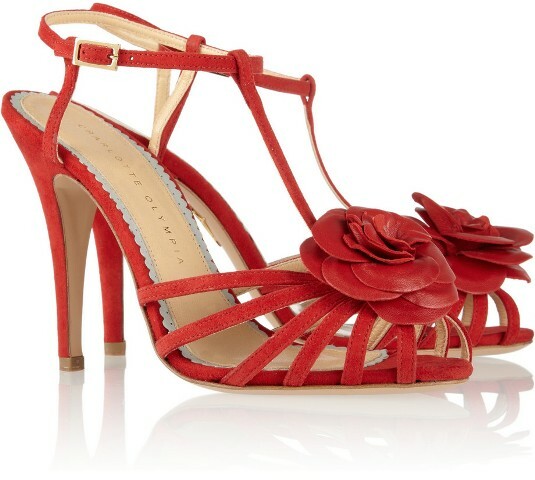 Tip 2: How about teaming this red hue sandal with a black and white zebra dress. I personally love these zebra dresses because they look fabulous, and the other advantage is that white & black match well with red, so give it a try and give us a feedback. A red hue purse will be the option for this trend. 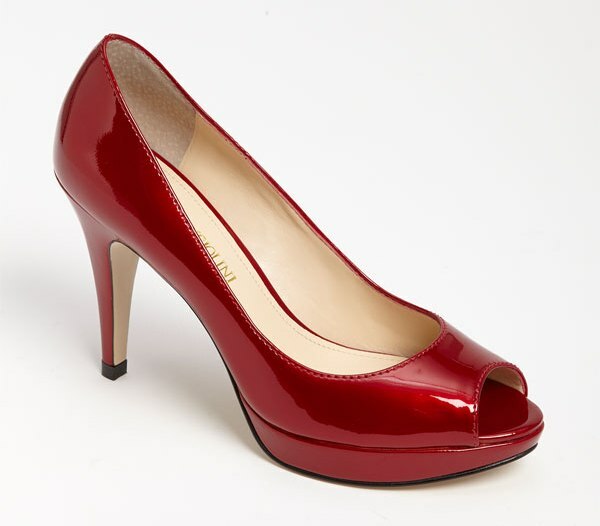 WOW, this is a wonderful formal red pump for working class ladies. If you want to dress and impress men or get respect from your employees while at work, try out these golden heel pumps. They have a floral mesh upper which is transparent, a pointed toe and a slip-on style. Tip 1: You can wear these Lace-mesh pumps with narrow leg red pants; make sure that the pants stop just above the ankle so that this pump gets enough exposure. Then complement the red pants with a white long sleeved blouse, leave the last two buttons of the blouse open to show off the golden necklace, then match the outfit with a pure leather purse, you can also wear some red lipstick. There is something unique about these bow pumps. If you don’t want to wear red high heels or red platform pumps, why don’t you try out these couture bow pumps designed by Valentino? This is a great option for high heels, you will still look fashionable yet the comfort and ease which comes with them is un-measurable. This Couture Bow Pump features a peep toe, shiny patent leather upper, a slim short heel which makes them easy and comfortable to wear and leather lining and sole. 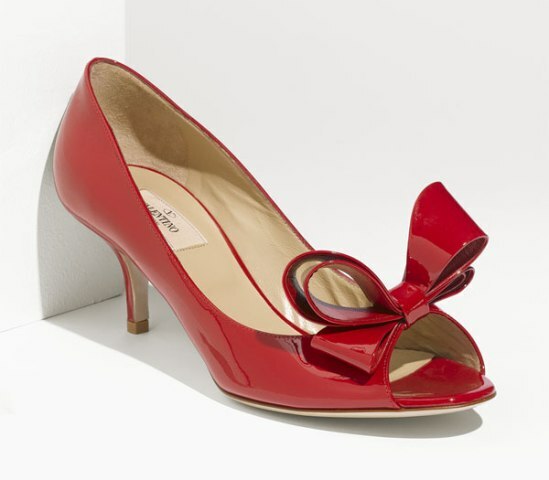 What to wear with this short Couture Bow Red Pump? Tip 1: My first choice will be a black jersey dress. This type of dress is short and sleeveless; they have a very narrow waistline and pleats. Since the dress is above the knees, the pumps will get enough attention. Since the dress is black, you can add value to your trend with a red purse of chain handbag. Red lips are not necessary, but you can try them just in case you love wearing red lipstick. Tip 2: How about a floral dress which has red / blue / black/ and yellow prints. This type of dress can match with more than on color of shoe, so you can also wear it with this short pump. However, the dress has to be above the knees by 1 – inch. Tip 3: Do you love metallic or golden dresses. If yes, then this classy short red pump will match with a dark golden or metallic dress. Please, keep this trend very simple, wearing red lipstick will complement the red pumps. Have you been looking for an exclusive red pump to wear to a party or work? 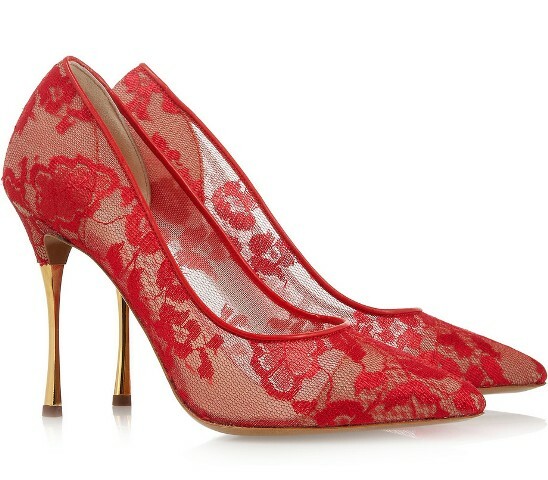 This Demario’ Red Patent Pump designed by Enzo Angiolini is the best red shoe i can recommend. It does not matter which position it scores on this list, what matters is the quality and beauty of this shinning red pump. It features an open toe which will ensure that your toes get no pressure from this pump, so if you plan to wear pumps the all day, i suggest you opt for this style of shoe. It also has a medium heel and platform, which makes the shoe very comfortable. Other features include patent leather upper, synthetic lining and sole. What to wear with this shining red open toe pump? Tip 1: Do you love yellow dresses, if yes; this cool shiny pump will look good on a yellow dress. All types of yellow dresses will match with this shoe, because it has a medium height. If your dress requires a belt, you can complement it with a red slim belt, and then match the outfit with a red purse. Tip 2: I can’t forget a white dress. You can team red pumps with a white dress. In general, white is a neutral color so it will match with most colors. Since the pumps are medium, you can wear a short white dress, and then complement your dress with a red slim belt and a red chain-link purse. Note: If your dress doesn’t require a belt, please don’t wear one. When we talk about red shoes, I don’t want us to think on pumps and high heels only, let’s also consider women who don’t wear pumps or high heels. 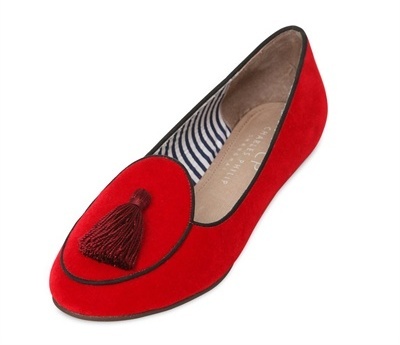 You might even want to wear these red loafers on weekends. Slip-on shoes are easy to wear so you can even wear them to work on Friday. When it comes to styling, you can wear this red loafer with white chino pants. To look fashionable, try to fold the bottom of your white chinos so that you create enough space for your loafers. Then complement your white chinos with a black slim top. You can also team them with denim blue jeans and white shorts. All you have to do is to match your trends very well so that you create a balanced color contrast. At least we have two types of red sandals for those who love wearing red sandals. This leather sandal has a simple design, so if you don’t feel comfortable with platform sandals, then opt for this t-strap Rosa rose-appliquéd leather sandal. Women who wear long dresses, this sandal will match with such dresses, in this case, let’s opt for a printed red / gold and blue long dress, let the dress go below the knees by 2 inches, and then complement your trend with a gold purse. If you want to go for a vacation or a weekend gateway, you should pack these comfortable red keds with you. Have you ever wondered why many women on vacation wear keds, it is because these shoes are too comfortable and easy to wear. Taylor Swift calls them champion sneakers. If you think I’m just bluffing, try then out and give us a feed back. They feature canvas upper, textile lining and a rubber sole. What to wear with red Keds for women? Tip 1: Wear red kids with short denim jeans. To add value to this trend, you can complement your distressed denim shorts with a white long sleeved shirt. To look smart, tuck in the shirt with your shorts, leave the last two – three buttons of the shirt open, and then fold the sleeves of the shirt to look casual and smart. Tip 2: Wear red kids with dark denim blue skinny jeans. Team your skinny jeans with a black and white horizontal strip long sleeved t-shirt. Then accessorize with black round sunglasses and complement the red keds with red lips. Tip 3: How about teaming them with white skinny jeans. 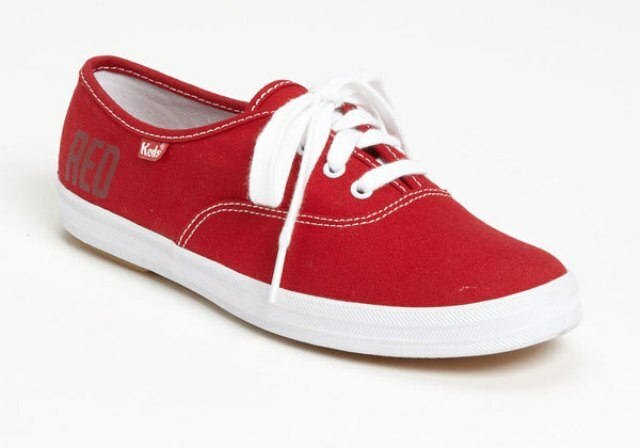 This is one of the best ways of wearing red keds. You can wear red/white stripped t-shirt with your white skinny jeans. If the jeans are too long, fold them just above the ankle. Tip 4: Do you love wearing floral skirts with keds, if yes, opt for a short red/white and green floral skirt. Complement the skirt with a plain white top.